— constitute the essence of efficient marketing and sales through regular marketing media or online marketing. 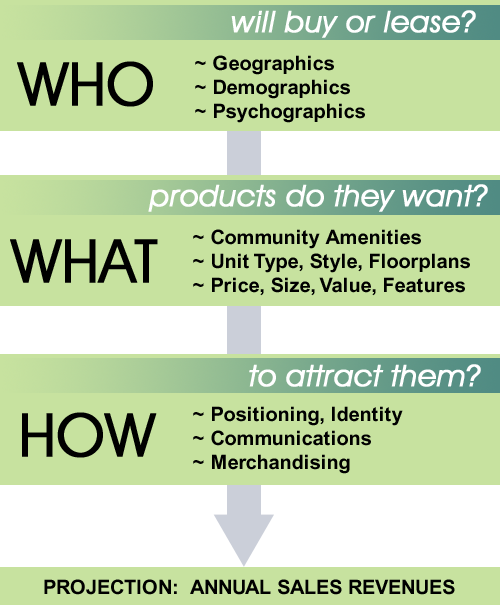 These three key elements – Who, What, and How are the basis for Marketing Success in guiding businesses of any kind including community developers, hoteliers, and home builders toward rapid sellout of all types and prices of new homes and rental apartments. As a member of the Real Estate Marketing Alliance, the team specializes in working with land developers and both home builders and commercial builders. With modest modifications, these three key concepts can be applied directly to retail, commercial and industrial real estate as well as housing, not to mention any business attempting to attract new prospects. PTC Computer Solutions has been involved in the design and development of countless web sites through the years as well as designing and redesigning logos and other graphics around the country and internationally. PTC Computer Solutions is a full service web site design and development company operating out of Jacksonville, Florida since 1996 developing sites and supporting networks in Jacksonville, Florida as well as throughout the country and internationally. Though PTC specializes in database driven and multimedia intensive web sites including e-commerce sites, we have many basic “brochure” sites for customers just needing exposure on the web. We have many more sites recently completed if interested. Contact us for more information at info@ptccomputersolutions.com or by telephone at 904-992-9888. We perform work on a project by project basis for the individual company. We do not use templates or previously completed work but, rather, customize each site to the needs of our customer. Though there are many variances and personalizations to each site which would require a complete proposal, we can offer a site such as you have asked us to quote for an amount defined in a formal proposal. If this is acceptable, please contact us directly and we will get started. Thank you for considering PTC Computer Solutions (www.ptccomputersolutions.com) for your web needs and we look forward to doing business with you. This is a dilemma I’ve been contemplating for some time. Should I develop a strategy for SEO or is it worth my time? PTC Communications, at http://www.ptccommunications.com, is a company that specializes in assisting people self publish. But, one of the things that struck me was that they can do so much more with SEO and SEA, and SER especially. If you need help with getting higher rankings on search engines and establishing your social media networking presence, then PTC Communications and it’s parent company, PTC Computer Solutions, can help you.